Tinaroo Waters Birds and Barra offers the most experienced fishing guide in the business. 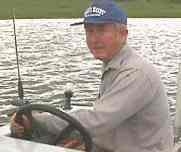 Jack Leighton will help you catch the 'Big Barra'. Lure, Fly or Bait Fishing. The Queensland Fisheries Management Authority has organised recreational fishing for Barramundi and Crayfish in Lake Tinaroo. Lake Tinaroo is being stocked regularly with fish. Barramundi do not breed because they have no access to salt water to spawn, therefore, the closed season (set due to breeding periods) does not apply. Similarly, the maximum size limit (set to protect large female Barramundi) does not apply, as the females can not contribute to the natural spawning process. All Barramundi caught at Lake Tinaroo between the 1st of November and the 1st of February must be tagged as with Barramundi which exceed 120cm. This is proof to authorities that the fish caught are in fact a legal catch from Lake Tinaroo. The change in regulations enables recreational fishers to fish for Barramundi and Crayfish without harming wild self-sustaining numbers. The minimum size limit is 58cm. The bag limit is five Barramundi. Crayfish pots are available on the Tablelands for recreational use.